Avast Ye, Mateys! Lookit Thar! It Be A Chest Of Gold! But How To Divvy Up Th' Loot? Aye! Draw Yer Cards And Watch Out For Yer Horn-Swagglin' Mateys! Gamblin' Be Th' Pirate Way! 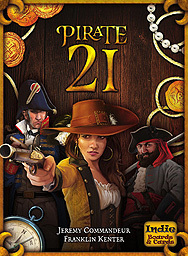 Pirate 21 is a competitive game for 2-6 player. Each player tries to get 21 without going over. Sound Familiar? It is, but in this version of 21 you have Pirates that can knock an opponent out of the round, Mates & Captains that can swap cards and Princesses to defend You. Draw your cards, and bring your best trash-talking pirate voice to the table.